"I tell you, this is a pretty tame rally compared to the ones I run," Dale Potter said Thursday. The retired Air Force pilot was among 30 or so men and a couple of women from the anti-wolf brigade who mostly chatted among themselves and with reporters. They gathered at noon, 90 minutes before U.S. District Judge Donald Molloy opened a hearing to discuss a recent settlement hammered out between the Obama administration and 10 conservation groups to return wolf management to the states in Montana and Idaho. Molloy also took up the matter of wolf hunts. Many of the protesters wore camo, and they brought signs, bumper stickers, cameras and - in Potter's case - three graphic color photos of recent cattle mutilations near his home in northeastern Oregon. Some of the signs were anti-Molloy. One called wolves "biological warfare weapons against people." Another espoused "zero tolerance for Canadian wolves." "We'll be here all afternoon until it's over," said Toby Bridges of Missoula, who spread word of the rally, dubbing it a "howl in protest," on his Lobo Watch blog. Bridges expected dozens more people to join as the day went on. Instead, the numbers dwindled to fewer than 10 by 3 p.m., an hour before the hearing inside wrapped up. There were few sidewalk confrontations. 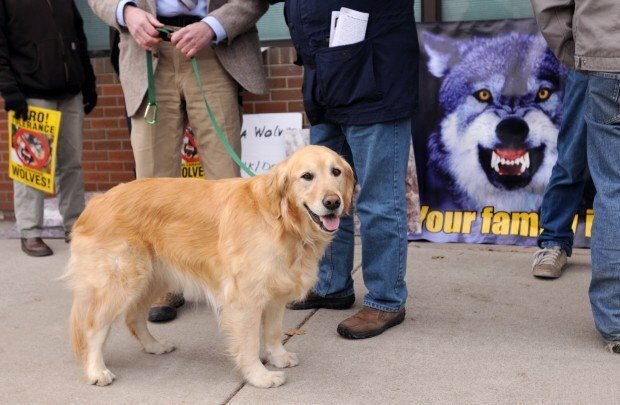 Bridges organized a similar protest last June when Molloy took up the question of federal wolf protection under the Endangered Species Act. "We're just looking for a bigger, stronger show of force than back in June," he said. "That was a decision whether to have (wolf hunting) seasons or not. This is a whole change of direction. This is like ... they're going to rewrite the whole plan again?" Potter, 76, views his Wallowa County as "the beachhead for the wolf invasion into Oregon" and figures there are already 100 wolves there. It's clear where he stands on the issue. The small Nissan car he drove over from Joseph, Ore. - picking up Idaho protester Stan Celmer of Kamiah on the way - bears the personalized plates "NOWOLVES." It cost him an extra $100 to get them, he said. His calling card identifies Potter as "Wolf Removal Coordinator" and, on the back, lists the wolf management practices he espouses: aerial gunnery, long-rifle shooting, trapping/relocation, poisoning and wolf den gassing. "The wolf management that I'm promoting for Oregon is: Get the wolves out of Oregon by any means necessary," he said. 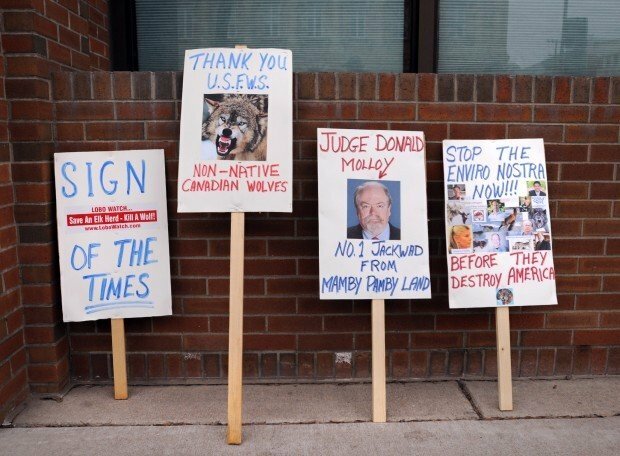 Wolves faced two kinds of hunts during a hearing before U.S. District Judge Donald Molloy on Thursday. A proposed settlement between wolf advocates and the federal government could open up public wolf hunting in Montana and Idaho, if Molloy supports it. But he's also considering an older case that considers how federal and state authorities could kill wolves while they're still protected under the Endangered Species Act.